LOCATION.--Lat 41`32'29", long 77`58'49", Potter County, Hydrologic Unit 02050202, on left bank on upstream side of bridge on State Route 3001, 2.5 miles upstream from mouth. PERIOD OF RECORD.--October 2010 to current year. GAGE.--Water-stage recorder and crest-stage gage. Datum of gage is 1,170 ft above National Geodetic Vertical Datum of 1929, from topographic map. Satellite telemetry at station. COOPERATION.--Station established and maintained by the U.S. Geological Survey. 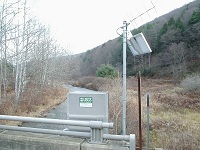 Funding for this station is provided by the Pennsylvania Department of Environmental Protection. FLOOD STAGE.--No flood stage has been determined for this station.